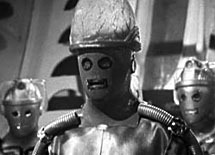 It's far from easy to tell unless you've got a good ear for voices, but the classic era Cybermen had quite a strong continuity of actors, especially from "Earthshock" onwards - David Banks played the Cyber Leader in every serial from then on, going on to write his Cybermen book about both his Cyber-career and the species themselves, and Mark Hardy was his faithful Cyber Lieutenant most of the time too, excepting "Attack of the Cybermen," where he was otherwise engaged when the serial was scheduled to film. In "Attack," as it happened, Banks was offered the role of Cyber Controller - a promotion of sorts - but turned it down, having got attached to his smugly superior, order-barking Leader persona, so instead the producers looked back: 18 years back, to the first Cyber Controller. "You belong to us. You shall be like us." [...] "To struggle is futile." Remind you of anyone? Yep, the Borg evidently assimilated Telos at some point, along with a good speech-writer, since 95% of their dialogue is just the Cybermen with punchier vocab. Michael Kilgarriff was the man in the Cyber Controller suit back then (and he did indeed reprise the role in "Attack," though by then he'd put on some weight, but frankly with all the serial's other quality issues, a portly Cyber Controller was the least of its worries) chosen for his resonant voice and towering height. The height, certainly, no matter what the tinny voice changer did to his rich tones. From the start the Cyber actors had been chosen for their statures (rather than, for instance, their resistance to claustrophobia, which tended to cause issues on the first day of dress rehearsals), but at 6'7" and with a giant cyber-brain sprouting from his bonce, the Controller dominated every scene he was in. It's a bit of a shame, then, that the Cyber Controller figure doesn't, since even Character Options mania for new sculpts for the filmsiest of reasons has limits, and apparently adding a teensy bit of height to the standard "Tomb of the Cybermen" body is that limit. 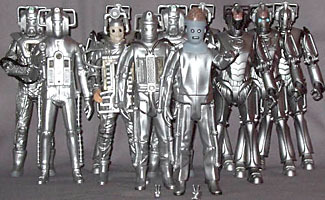 I'm not criticising though - shorter than their boss though they were, the other Cybermen were still six-foot-plus, so the difference in height would translate to a smidgen in action figure scale, and you have to draw the line somewhere or production costs will just send you out of business. And while there's obvious re-use from the basic "Tomb" Cyberman, they haven't skimped anywhere where it would affect the physical accuracy of the costume. Most obviously the Controller has no chest unit - that's a plug-in on the Cybermen figure, so the Controller's torso is new (with additional plug-ins for the shoulder tube-ends too) - plus his pants aren't tucked into his boots, his shoulders have no cables running behind them to the back of the mask, and his glove backs are smooth, without the exoskeletal ridges. He also has a second pair of tubes on his legs, side-back in addition to the usual side-front ones, which plug into new ports the basic figure doesn't have; actually, it is starting to look a bit odd that they didn't just sculpt the whole thing fresh, since all that's left unaltered are the elbows, forearms, and hips. Variations aside, the body is very similar in sculpt and paint to the basic Cyberman - even the parts cast new, for extra (or omitted) plug-in sockets for parts, like the torso and legs, are the same sculpt design, just modified accordingly. What is new is the head - it's even a completely different finish, flat grey in place of silver, as if it's determined to stand out, though before anyone asks, yes, that's accurate to the real thing. Heaven only knows why, since it's not like you'd mistake the giant brain Cyberman for a normal one. The brain is almost ideal, replicating the original design commendably - smoky orange shell, grey "veins" painted onto its surface, fade to plain grey around the base - but it's not quite transparent enough, so unless you hold it up with a strong light behind it, it looks like it's just painted, not semi-see-through. It is, and there really is a smooth brain-shape inside, but at this scale and without the interior lighting of the original prop, the look doesn't quite work. 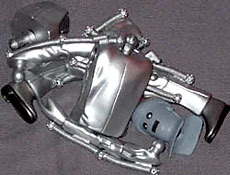 Sharing so much of the design, the Controller has articulation identical to the basic Cyberman as well, and the plug-in system for keeping the limb tubes looking right while allowing them to bend works just as well, even on the double-tubed legs. No neck, swivel shoulders and biceps, pin elbows, swivel wrists, swivel waist, swivel/pin hips, pin knees, swivel ankles. The tubes above the shoulder balls are attached to the torso only, so raising the arms leaves them connected to nothing, but that's the only unsightly-use-of-joint problem around, within reason. Since the Cyber Controller is an accessory himself - packed as a BAF with the "Next Doctor" Cyber Leader, and the "Tenth Planet," "Tomb of the Cyberman" and "Invasion" Cybermen, he doesn't have any toys of his own to play with; all that might have been appropriate in any case is Cybermats, and they came with the relevant Cyberman anyway, so no cause for complaint there. On the subject of him being a BAF, though, assembly - while straight-forward - isn't exactly a doddle. The head and arms popped into place right enough, but man was it a fight getting his legs onto the hip balljoints; I was worried I was going to do some damage there. To the credit of the materials, they survived the process just fine; my fingers took a while to stop aching though. 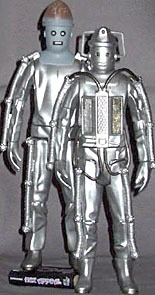 So, the Cybermen action figure mini-series as a whole - I can't imagine any Doctor Who fan being displeased. Maybe the Cybus Cyber Leader will grate a little, since collectors will in all likelihood have a few of the new model Cybermen already, but he's got that black-face-plus-brain thing going to make him worth a look. 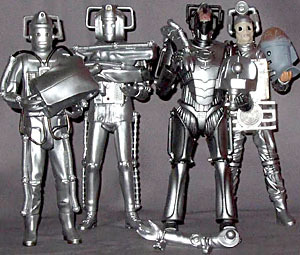 The other three Cybermen are unique, manufactured with care and attention to detail, and the Controller is the perfect BAF: if you care enough to want him, the prospect of buying the four necessary Cybermen won't be a difficult one anyway. "Invasion" | "The Next Doctor" | "Tenth Planet" | "Tomb of the Cybermen"